"Like" token, awarded by januz. "Grey Medal" token, awarded by ygtsvtr. "Like" token, awarded by gottfried. This allows is for aligning objects on the grid more easily. This is especially useful for game development with modular designs. I implemented the functionality in the applyGridIncrement function. I tried to respect the transform constrains but for now only constraining to the global transform orientation will make much sense since the goal of this snapping type is to absolutely snap to the global grid. Either a new icon needs be designed or my proposal would be to add a checkbox to toggle between absolute and relative/incremental grid snapping. 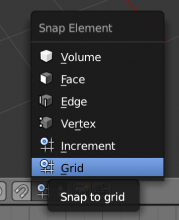 The other problem is as initially mentioned that I reused the grid snap element currently used by the node editor. Fabio Arnold (donfabio) raised the priority of this task from to Needs Triage by Developer. Fabio Arnold (donfabio) added a project: BF Blender. Fabio Arnold (donfabio) set Type to Patch. Fabio Arnold (donfabio) added a subscriber: Fabio Arnold (donfabio). Here you can also invert the condition to avoid !!. I don't really understand what exact issue with supporting constraints is? As for interface, making it a checkbox seems to be wrong -- grid snapping is not a part of incremental snapping IMO. But here would like to hear proposal from our UI team. Fantastic! I've been hoping someone would tackle this, thanks so much. I prefer the original implentation over the toggl. As Sergey pointed out, it's not part of incremental snapping. Iconwise we could change Increment to either a numerical representation or maybe a grid of dots (to show the steps, but not invoke the link to the grid?). Sergey: I adopted your logic improvements. Didn't know about the ELEM macro. Also I thought the double negative (! (a != b && c)) was intentional and easier to grasp for the one who wrote it so I kept it originally. The issue with the constraints is I handle them in the applyGridIncrement function itself (right now only 'APPLY' and the three axis). I don't know if there's more I should check and whether the function is the best place to check. For the UI I can see why you want them as separate types. The incremental doesn't really behave as "relative grid snapping". Another thing I would like to see is a custom grid snapping factor. So you could snap your vertices to 1/8 of a Blender unit without scaling the object for example. Right now we only have these SMALL_GEARS and BIG_GEARS types which respectively map to a factor of 0.1 and 1.0. Could we use a numerical input next to the snap buttons or would that be to too cluttering/ugly? The most logical way would be to adjust the grid itself. Otherwise I think we're overcomplicating a feature that's really only about snapping to the grid. The 0.1-version is just a nice extra that's consistent program-wide and the user would expect to have it. I think there should somehow be a custom amount of grid subdivisions configurable by the user like 8 or 16 instead of only 10. This would also mean to change the hardcoded 0.1. But that's certainly for another task. We should avoid adding more elements to the 3D View header, so adding it to the Snap menu is the better solution. @Paweł Łyczkowski (plyczkowski), Icon City is your kingdom, right ;) ? @Jonathan Williamson (carter2422) and @venomgfx, goal for 2.73? I can handle review. On the left is absolute grid snapping on the right is incremental. When using the absolute grid the object will snap to the grid. That's why the sphere in the icon is off center (I also moved the grid lines by 1 pixel to match the center of the blue dot). The idea is when using incremental the object keeps its current position and moves from its current position in increments. That's why it's in the center of the icon. I've been wishing to have this in Blender for some time now. Great work! I agree that Grid and Increment should each be its own option, it fits better into the existing interaction system. The icon looks good to me, but would probably need to be checked with the UI team, since it re-purposes an already existing icon. Thanks for tackling this @Fabio Arnold (donfabio), I will try and review the functionality and UI in the next few days. This has been needed for some time now. @Fabio Arnold (donfabio) this should probably be a diff, rather than a tracker task? Easier to make review of the code, see https://developer.blender.org/differential/diff/create/ .